One of the most popular coins to ever come out of the Royal Canadian Mint is the Canadian Silver Maple Leaf. The coins were initially introduced in 1988 and became extremely popular on its release with both investors and collectors. These coins come in 1 oz size and are made of .9999 fine silver. The Canadian Silver Maple Leafs, even in their cull condition have a lot of demand due to their pure silver content. Each coin in the roll contains 1 troy ounce of .9999 fine silver, totaling to 25 troy ounces. Each coin in the roll is in Milky, Cull, Damaged, Circulated, and/or Cleaned Condition. 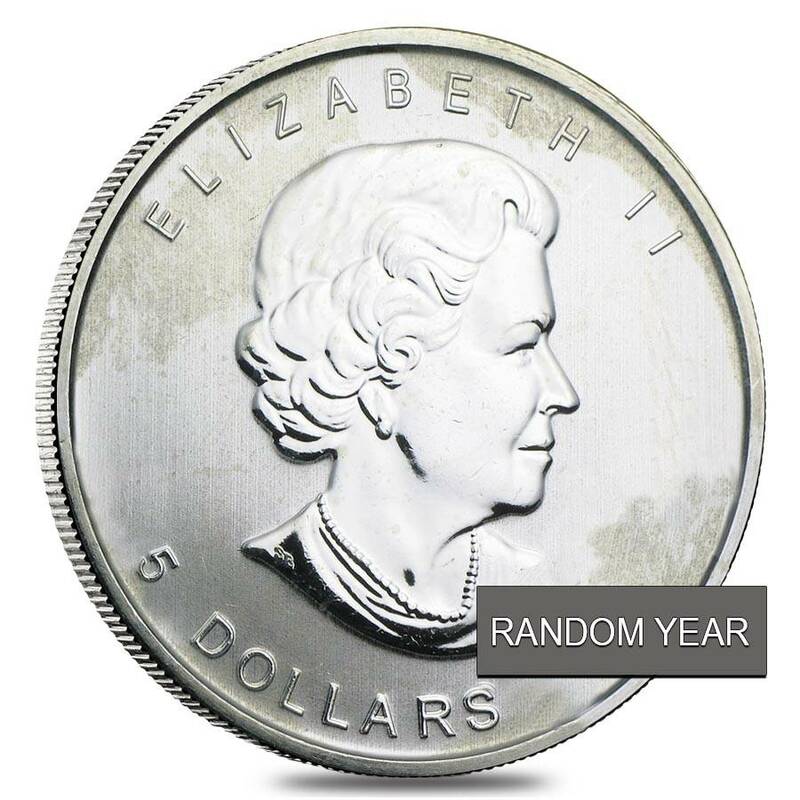 Each coin has a Face Value of 5 Canadian Dollars. Multiples of 25 are shipped in protective plastic tubes. Dates will be chosen randomly based on availability, therefore, the roll may contain coins of the same year or could be just a mix of different dates. Canadian Silver Maple Leaf are a Canadian Government authorized legal tender issue. The coins are made of 1 oz of .9999 fine silver. Widely recognized hence easy to buy and sell. Lot of 25 coins come in protective plastic tube, hence easily portable and easy to store. The coins in their cull condition may not be numismatically appealing but they provide amazing affordability due to their low premiums for investment purposes. These Canadian silver coins help diversify and stabilize investment portfolio. 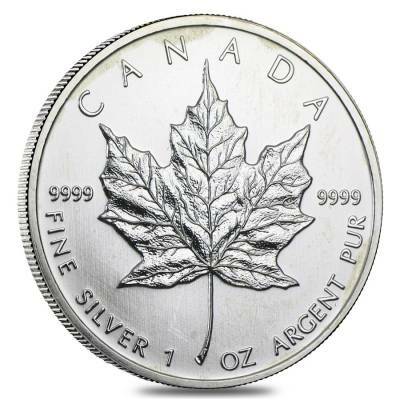 1988 was the year when Canadian Silver Maple Leaf Bullion Coins were first released. They are legal tender bullion coins authorized by the Canadian Government. The coin features a right facing portrait of Queen Elizabeth II on its obverse and on the reverse it features the important national symbol of Canada, the maple leaf. The coins were provided with some security features in 2014. In pristine condition, these coins are very popular for their numismatic as well as investment appeal. However, in their cull condition they might have lost their numismatic value due to their poor condition. The coins can have pits, holes, bends, abrasions, scratches, dark toning, milky spots, and many such features which transform the coin into cull condition. Along with these, some people might just use chemicals to clean or scrub the coins through which the coin totally loses its numismatic value. Retooling is also causes this. The coins in cull condition are not preferred by collectors as they have flaw in their appearance. However, the coin’s content, weight, and purity still remain the same. The coin still has 1 oz of .9999 fine silver, hence these coins are mainly preferred by investors. These coins command lesser premium than their counterparts in pristine condition. Also another important point is that any coins bought in bulk command lesser premium than buying an individual coin. Hence a preferred way of buying cull coins is in bulk so that the investor gets the maximum advantage of buying in bulk. 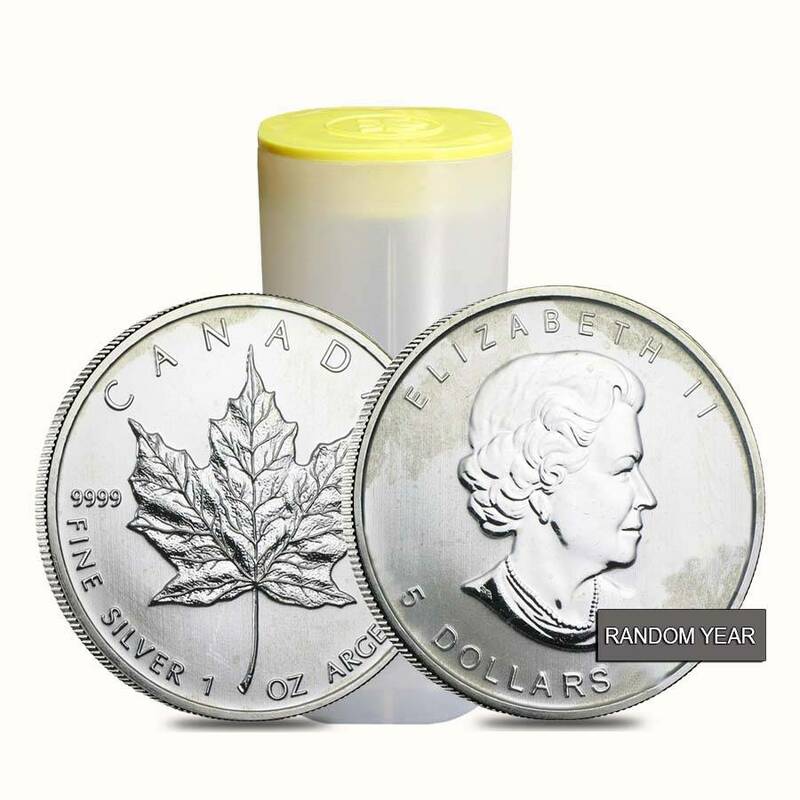 Bullion Exchanges is pleased to offer the Roll of 25 - 1 oz Silver Canadian Maple Leaf (Milky, Cull, Damaged, Circulated, Cleaned) at one of the most competitive prices in the industry. Browse our vast collection of Canadian Maple Leaf Coins now. Also check out our other collections of Silver American Eagles and Chinese Silver Panda. Feel free to contact us at 800-852-6884 if you have any questions in regards to any of our products. With this purchase, you earn 417 Bullionaire Bucks 417 BB = $0.42. For every $1 spend, you will earn 1 Bullionaire Buck which is equivalent to $0.001 off a future purchase. 417 BB = $0.42.